سواءً كنت مسافراً بغرض السياحة أو العمل، فندق شانجريلا، ذا مارين كيرنز هو خيار عظيم للإقامة خلال زيارتك للمدينة. يسهل الوصول إلى هذا الفندق ذو 5 نجوم من المطار، فهو يبعد عنه مسافة 8.0Km فقط. يضفي محيط الفندق اللطيف وقربه من أكثر المعالم السياحية جذبًا سحرًا خاصًا على هذا الفندق. يعمل فندق شانجريلا، ذا مارين كيرنز على ضمان إقامة مريحة لضيوفه من خلال خدماته الممتازة وحسن ضيافته. يقدم الفندق فرصة للاستمتاع بشريحة واسعة من الخدمات بما فيها: خدمة الغرف على مدار الساعة, واي فاي مجاني في جميع الغرف, خدمة التنظيف يوميًا, خدمة سيارات الأجرة, خدمة حجز التذاكر . لقد جهزت هذه الإقامة الفندقية بعناية فائقة لتوفر مستوى عالي من الراحة. في بعض الغرف يجد النزيل تلفزيون بشاشة مسطحة, اتصال لاسلكي بالإنترنت, اتصال لاسلكي بشبكة الإنترنت (مجاني), غرف لغير المدخنين, مكيف هواء. يمكنك الاستمتاع بالأجواء المريحة التي تقدمها مركز للياقة البدنية, حمام سباحة خارجي, مسبح (للأطفال), حديقة طوال النهار. مهما كانت أسبابك لزيارة المدينة، فإن فندق شانجريلا، ذا مارين كيرنز هو الخيار الأفضل لإقامة مثيرة وممتعة. خدمة المواصلاتمتاحة لقاء رسم إضافي. للتمكن من حجزها يرجى إخبار العقار بتفاصيل سفرك قبل وصولك. Located right next to the marina on the esplanade. Plenty of restaurants within a 5-10min walk. Staff was very helpful all through. Room - spacious and comfortable with all usual amenities. House keeping on couple days only cleaned the room after 4pm - wasn’t an issue for me as was anyways out while they did it. Pool is of decent size...sun beds were available in plenty during my stay (that could be as was a rainy couple days :) Gym is reasonable - has a couple cardio machines, bench press and dumbbells till 20kg....helps that is open 24hrs. We stayed in Pullman and Shangrila. The comparison showed a low price ratio of shangrila. Location is good, while the inner structure is so weird, which needs long walking time and so annoying if u r tired. How can u imaging it is a five star? I will give a 4 star only. The receptionists are ok but other staff art numb-face. 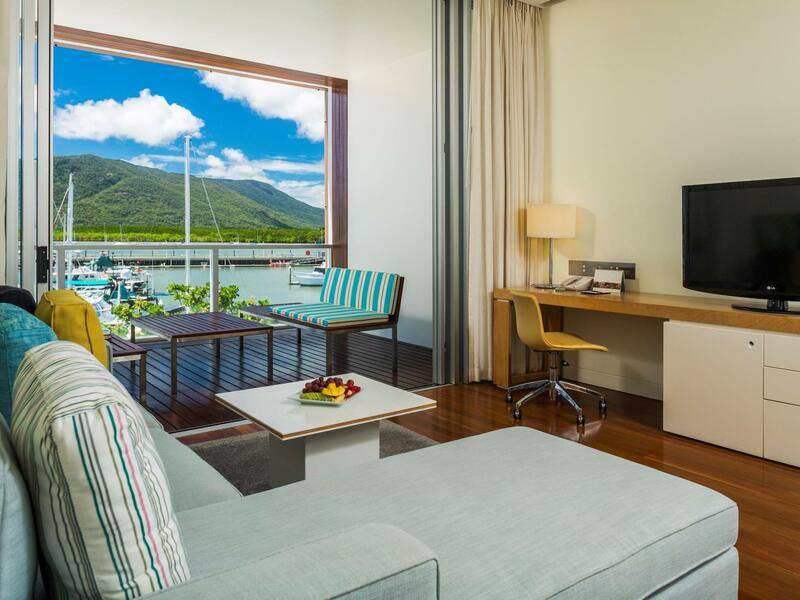 love the location of Shangri-La Cairns. right by the water, with plenty of very good restaurants ( Mediterranean, Aussie, French, Chinese, steak house, etc) - next to the reef fleet terminal wher you can book her excursions to GBR, Green Island - really like breakfasts included daily and the afternoon canapé's with tea/coffee -- highly recommended only , if you have knee/hip/back problems , the hallway leading to Horizon rooms can be lengthy. If you ever wanted to go snorkelling, this hotel is the place to be. Situated just beside the reef terminal. Great! Enjoyed the Excellent View & Excellent location. 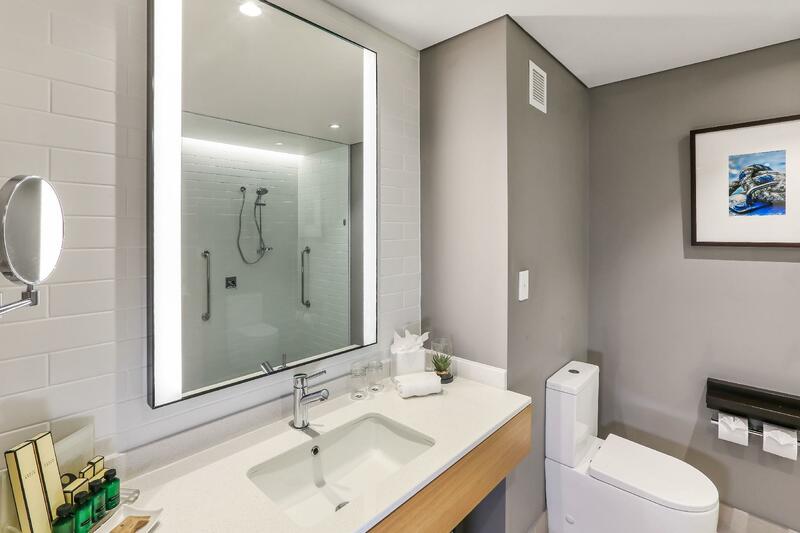 Very convenient, within walking distance to the Cairns Night Market, Reef Fleet Terminal & other amenities. 15 mins drive from the Cairns Airport. The hotel is conveniently located right next to the piers and a the main tourist belt is just a 5 min stroll away. The room was very nice with separate bath and shower. We booked a sea-view room under a great deal with Agoda (Staying at the Shang was cheaper than many other hotels). The view was great, overlooking the Cairns seafront. Parking costs extra. Shangri-La is well known for its customer service and this was no exception. Customer service will make or break a property and from the moment you arrive until you leave, the staff is exceptional. The property is located on the marina so the view is spectacular in the evening. The room was spacious, with a balcony overlooking the marina. The amenities included bottled water, full range of toiletries and as the room had access to the Horizon Club, you could choose breakfast i noted horizon Club or in the main breakfast area depending if you had an early morning. Happy Hour in the Horizon Club was hit or miss. It was usually understaffed and well attended which meant food ran out quickly and was not replaced fast enough, drinks took a long time even though it was somewhat self service. A great feature but it needs improvement compared to the other Shari-La properties. There is never a question about staying at Shangri-La; always a great experience! We booked a Horizon Club package, and it was overall well worth it!! The room was fabulous ( although the surfaces around room were showing some signs of wear and tear - but no big deal) with a really comfortable bed, nice living area and large well equipped bathroom. The balcony was huge with comfortably cushioned furniture and views directly over the marina and the mountains behind). Despite its location over the marina with it's plethora of bars/restaurants our room was really quiet. The cleaning staff were great, unobtrusive and yet getting room cleaned as soon as possible. 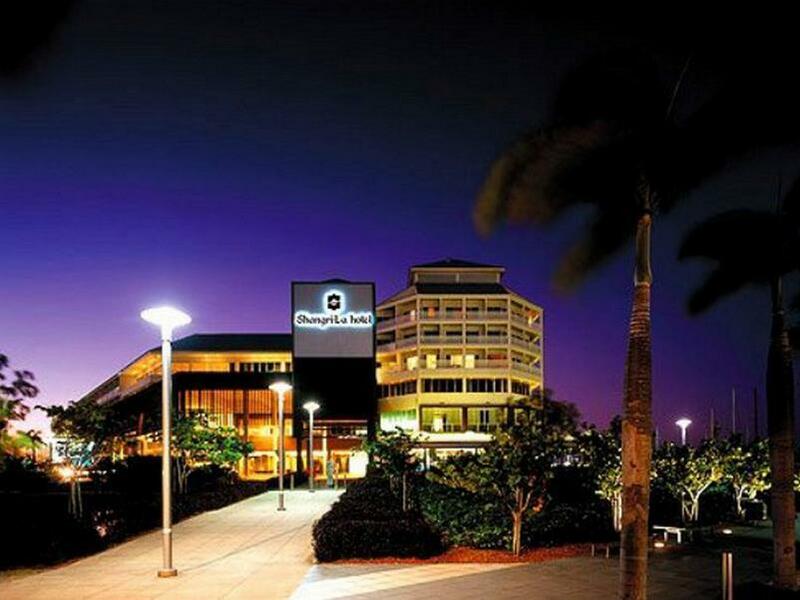 There are a multitude of shops within the hotel complex and it really was a superb location to see the centre of Cairns, and a base to look around the Cairns region. The food in the club lounge was fine - breakfast was really good with a reasonable selection available, evening canapés were great, as long as you like Asian food. The wines provided were of good quality. Wifi was free, but car parking (valet) was charged at 15AUD per day. The only downsides we encountered were with some of the staff/service. Some (not all) of the staff in Horizon Club made no attempt to pass pleasantries with customers and even made no response to our 'thankyou' when collecting plates. On the last day my wife rang housekeeping to request a sewing kit, 2 hours later it hadn't arrived! We made a follow up call and waited a further 30 minutes to no avail. Yet when I rang again and asked to speak to the duty manager, the sewing kit arrived within 2 minutes. Overall an excellent hotel, although maybe not quite of the overall standard of some other Shangri La hotels in Asia( but there again the reasonable price maintains the value for money equation). Hopefully the hotel will take on board the above issues, which were relatively minor, but the fact is that we remember them and they have a negative impact on what was otherwise a really good stay. Despite this we would not hesitate to stay at this hotel again. We had a great time. The hotel staff were really attentive to our needs. The hotel had a tour desk which made our trip more enjoyable as they helped us plan lots of sightseeing tours and activities for us. Overall, it was a lovely experience. I love this hotel, have stayed before and will again. Horizon Club Room is awesome, the food is delicious and the cocktails are great. Great location for seeing Cairns or just hang out by the pool or in the room. We spent four nights at the hotel, it was lovely. Staff are very helpful and friendly. We like the bathroom and the room. Good for business traveler because the hotel give complimentary WIFI to their guest. the rate was very affordable as it was on promotion! even cheaper than holiday inn... we checked in at 10am and we were immediately given a room. the room is very big with a large balcony with wonderful bay view. we bought some fruits from the supermarket nearby and we called the house keeping to borrow a knife and i was told it's fine. but when the staff came up with very bad attitude. he told me with his finger pointing at me that we have to pay aud10 for borrowing the knife next time. it really ruined our impression to the hotel. but generally the stay was great. I love the hotel with free wi-fi. And I loved the room with a beautiful view. On top of it,it is in very good location,cross the road , you can go to the booking center and take the curise to Great Barrie Reef,really, truely it is very convennient. Big rooms, great staff, excellent location! the room here is pretty big. the location is excellent. there is a mall connected to the hotel (that's where the gym is) and then there are several restaurants beside the hotel. 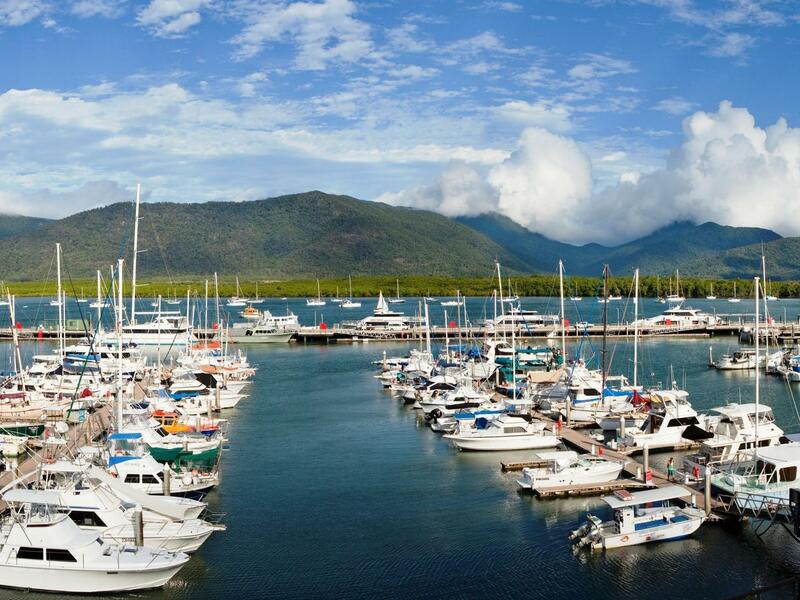 the terminal or pier to go to the great barrier reef is literally only a minute walk away. the staff is friendly. free wifi for this hotel! The Mariana view was brilliant and is definitely worth the price. The hotel is relatively farther from the center than other hotels, but all major spots are still within 5 mins walking distance. Hotel staff was helpful. Location close to esplanade and the reef terminal so that u don't need the pick up service! Save another fortune! Staff is really helpfull and effective. The hotel il quite big, but very well structured with a nice swimming pool and nice areas to chill and relax. It's next to the wharf from where all trips to the reef start. At walking distance from the (small) city centre. If you want, there is also a shopping centre in basement. Absolute delicious buffet breakfast. Staying here was certainly a real treat. More expensive than other hotels in the area but worth the extra $$, swimming pool was great but no spa (too cold for pool) Staff were very welcoming and kind Rooms were very clean and great sizes. Views on the wharf were incredible, especially with the beautiful morning sunrises. Stayed with our 1 year old and felt great that the room was very baby proof and safe. Clean and quiet top class hotel! Location is excellent, especially for those intend to join tour to Great Reef Barrier. Really enjoy the experience in Shangri La!